Beautiful Incentives: Coupon for 30% off entire Old Navy purchase! Valid till 10-14 Only. Coupon for 30% off entire Old Navy purchase! Valid till 10-14 Only. 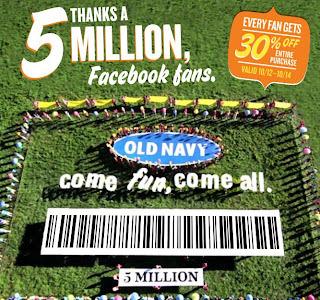 Old Navy wants you to celebrate their 5 million FB count with them. Get 30% off your entire Old Navy purchase! Valid till 10-14 Only. Have fun! Don't waist printer ink on this coupon! Just snap it with your phone! Also, a Reveal a Deal coupon for $10 off $50 on their Facebook page!